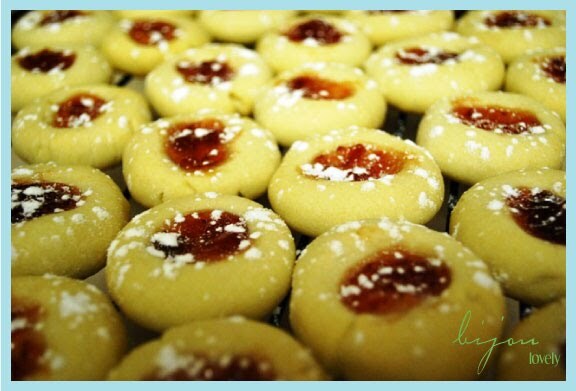 Bijou Lovely: lovely recipes: thumbprint cookies. 4 lovely recipes: thumbprint cookies. I started baking Christmas cookies tonight! 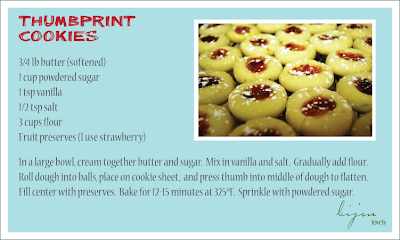 First on the list were thumbprint cookies...my favorite! I thought I'd share the recipe in case anyone would like to make a batch. They are really simple to make and they are seriously delicious! If you share this recipe, please credit bijou lovely. Or my mother. Either way, I'd appreciate it. Does anyone else make thumbprint cookies? Those look absolutely delicious and made me excited to do my own holiday baking! I've never made these before, but I think I'll have to try :) I, too, am a fan of strawberry; however, I'd like to try apricot. Have you tried any other fruit preserves in yours? I haven't tried apricot but I'm sure it would taste delicious! I might make another batch with apricot myself. yum yum! These would be great for a Cookie Swap! Yum- they look so good! And like that you sprinkled powdered sugar across the top; it gives them a nice finished look.